After World War II there is a huge housing problem in the Netherlands. The Dutch municipalities don't have enough funds to build a sufficient amount of houses. The NV Bank voor Nederlandse Gemeenten (plc Bank for Dutch Municipalities) starts issuing certificates of deposits from 10 March as part of the national loans for the construction of houses in 1952. The funds that are raised will be lend to the municipalities to finance the construction of houses and other urgent building projects like schools. SHOTS: - Building sites with houses under construction; construction workers at work; - houses in an new development; - int. 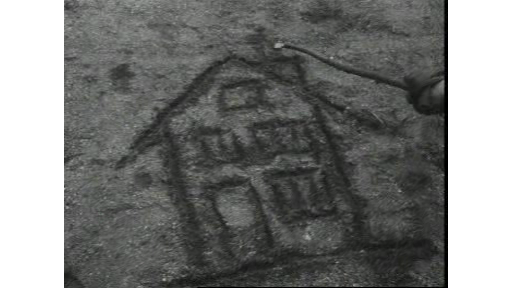 of a small attic room filled with beds and furniture; - furniture is stored in warehouses; - an engaged couple sits on a bench in the park; the man draws the house of their dreams in the sand with a branch; - int. post office: next to the counter is a promotional text; a line of people wait for their turn at the counter; the counter clerk sells a certificate of deposit to a woman; close up of a certificate of deposit.